Anyone who’s known me since high school knows that I used to have a rather unhealthy obsession with Romeo and Juliet, particularly Baz Luhrmann’s Romeo + Juliet , though I was also a big Shakespeare fan in general, calling Julius Caesar my favorite play for several years. When I first saw this trailer, of course I had to groan because of the pun in the title and the obviously goofy subject matter of gnomes in general, but the kids had cleaned up the house on Saturday and rain prevented us from doing something outdoors. Gnomeo and Juliet was the only kids movie I was willing to see (seriously, forget creepy looking Rango), so I “screened” the kids by showing them the trailer on YouTube. Trust me, with ticket prices the way they are, the last thing you want is to take the kids to a movie, sit down, and have them ask to go home 10 minutes in. Gnomeo and Juliet meet over a heart orchird. We went with my mother, who loves movies, and the film began with a little gnome giving the prologue on stage, but in keeping with this being a kids movie, a cane yanked him offstage before he could get to the whole “A pair of star-crossed lovers take their life” part. Although it’s been pretty heavily marketed here in the US, the movie is quite clearly for the United Kingdom crowd, since they’re the ones with gnome obsessions and the owners of the gnomes insult each other with British terms and accents. The story begins with a display of the rivalry between the Reds (Capulet) and the Blues (Montague) as Tybalt of the Reds and Gnomeo of the Blues face off in a lawn mower race down a rear dirt alley. Juliet and her hot-for-details Nurse. Later on, we’re introduced to Juliet and her overbearing “nurse” frog and Juliet struggles with never being taken seriously. She plans a secret outing in which she’ll capture a rare orchid growing on the top of an abandoned greenhouse across the street, which has a heart shaped lip. This is, of course, how Gnomeo and Juliet meet. While I expected a groanworthy children’s flick or even one that simply had misguided humor, I felt that the characters and jokes were amusing. A Mac-ish laptop displays a banana logo. A floating David Hasselhoff screensaver. There’s a “Borat” gnome in that detestable “swimsuit” he made famous and he even talks like him. There were Shakespeare references throughout, such as the setting being Stratford-upon-Avon or Gnomeo being “banished” to a park where Shakespeare’s statue is. I’ve seen some people blasting this movie because it just ravages Shakespeare’s work and misleads audiences into thinking it’s a straight up children’s version of the play. These people have to seriously lighten up. 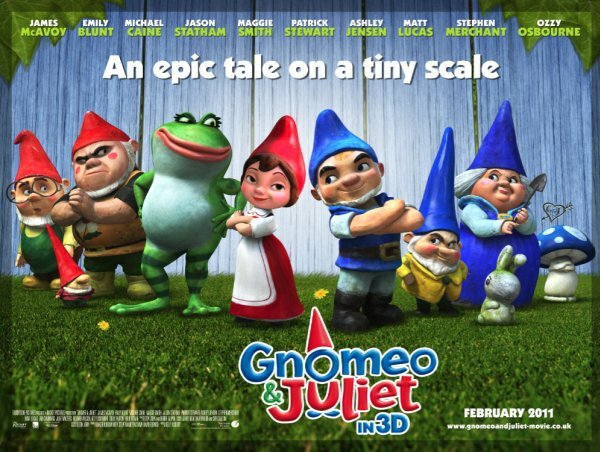 Sure, it’s called Gnomeo & Juliet and obviously draws upon his work, but that doesn’t mean it’s a direct depiction. This is a kids movie for crying out loud. I tend to judge kids movies by how much my children laugh during them and by how much I laugh during them and Gnomeo and Juliet satisfied both of these criteria. The gnomes were adorable, but not creepy and the plot of the movie was more than enough to keep my five and six year olds happy and laughing. Featherstone, the neon pink plastic flamingo with Miami flair, was the best character out of them all and even provided the heartclenching sad factor.